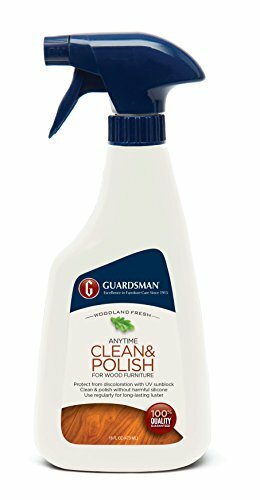 Guardsman Clean & Polish delivers a rich, clean, low-luster shine for a natural glow without oily, dust-attracting residue. Our premium formula contains UV absorbers, protecting wood against fading and discoloration from sun exposure. Used regularly to polish wood, it protects and beautifies while helping to conceal the appearance of fine surface scratches. Unlike some polishes, Guardsman Clean & Polish contains no silicones and won't change the sheen of your wood. Guardsman has been a leader in furniture care since 1915, delivering quality products and services for the protection, care, and repair of wood, fabric, and leather furnishings and bedding products. Backed by the strength of the Guardsman Corporation, the world’s largest supplier of wood finishes to the furniture and cabinet industry, Guardsman products include polishes and cleaners for fine wood, leather, and fabric furniture, as well as a complete line of furniture maintenance products for touch-up, repair and spot cleaning. Guardsman is also a leading provider of furniture repairs services. We visit hundreds of thousands of homes every year to successfully repair furniture—so you know our products work! With nearly a century of expertise in the furniture care business, Guardsman is an established, secure, and committed partner in maintaining the beauty and extending the life of your furniture.